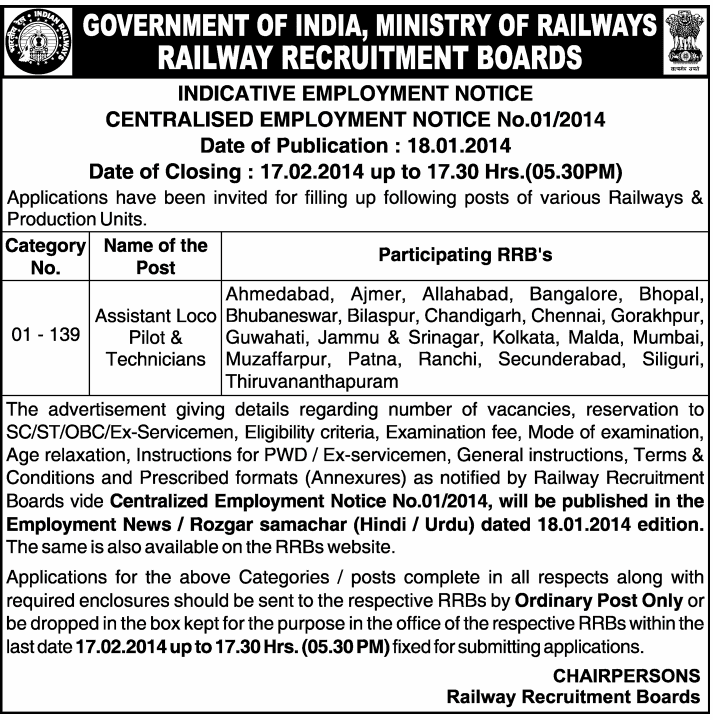 The advertisement giving details regarding number of vacancies, reservation to SC/ST/OBC/Ex-Servicemen, Eligibility criteria, Examination fee, Mode of examination, Age relaxation, Instructions for PWD / Ex-servicemen, General instructions, Terms & Conditions and Prescribed formats (Annexure) as notified by Railway Recruitment Boards vide Centralized Employment Notice No.01/2014, will be published in the Employment News I Rozgar samachar (Hindi I Urdu) dated 18.01 .2014 edition. The same is also available on the RRBs website. Applications for the above Categories / posts complete in all respects along with required enclosures should be sent to the respective RRBs by Ordinary Post Only or be dropped in the box kept for the purpose in the office of the respective RRBs within the last date 17.02.2014 up to 17.30 Hrs. (05.30 PM)fixed for submitting applications. rious railway and production units.